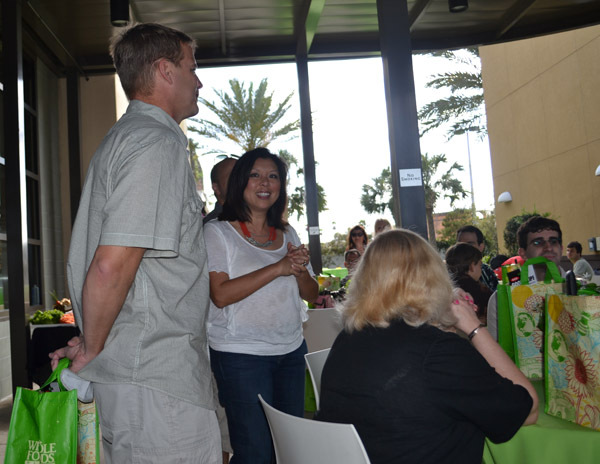 Last weekend I had the pleasure of attending the Orlando Food Blog Forum at Walt Disney World. It was an amazing experience enriched in food, knowledge and good quality people. I find it so hard to sit here and try to wrap up everything into one writing post. 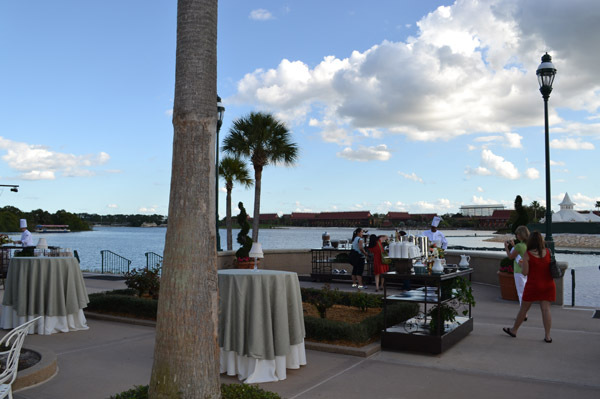 On the first day we attended a welcoming reception at the Grand Floridian Resort at the Summerhouse Patio. It was a beautiful evening weather wise and the patio had so many delectable eats waiting for us. We were greeted with a fresh cocktail and grazed from station to station. They had shrimp with special sauces, antipasti cones, gouda with caramelized onion chutney, made to order gourmet macaroni and cheese with white truffle sauce and assorted toppings of beef short rib and lobster to name a few. Beautiful chandeliers of martini glasses filled with various salads. The dessert bar had macaroons in the shape of a croquembouche with a Mickey Mouse on top. Blood orange timbale, crème brulee, and cake pops. It was wonderful and every bite was better than the next. It was cool seeing how many attendees had their camera out photographing the food. I felt like I was in my element amongst people who get it. How food is so amazing and fun to share with others. I met some great people that night. Everyone was so friendly and easy to talk to. It was lovely to talk about the excitement of the day to come for the speakers and workshops. On Day Two we headed out early to the Odyssey in Epcot. The breakfast was a Saint Patrick’s Day Eye Opener theme. From Bangers and Mash, Dubliner Cheddar Egg White Frittata, Boxty and Fried Egg, Irish Soda Bread and Tangerine Scones. Everything was amazing. I ate sausage for the first time in 15 years. Yes, it was that good. We heard from a variety of speakers who gave a plethora of information that I found myself writing dozens of pages of notes. They were all interesting and engaging. It was astounding how fast the time flew by. I will just name a small theme of what they had to say. • Diane Cu & Todd Porter. Some amazingly talented photographers who taught us all to share our food story. I was truly moved by their presentation and how they said your eyes are your lens and your heart is your shutter. • PRspectives with Thomas Smith, Jaden Hair, Rachel Barbarotta & Arianna Bastianini. They taught us to be passionate about a brand and be authentic. They had great advice for establishing relationships and yourself. • How to Write Bigger, Better, More Badass Food Posts with David Leite. He was very refreshing and gave it to you straight. He had 12 steps on how to be a better writer and keep people engaged in your stories. • Scott Hair had ultimate success advice and how to obtain your goals. • From Hobby to Professional with Dawn Viola. She taught us to sell yourself, but never sell yourself short. She gave advice on pitching and marketing. I loved her sense of humor. She had great things to say. After the speakers we broke for A Healthful Taste of Disney lunch at the Epcot World Showplace. 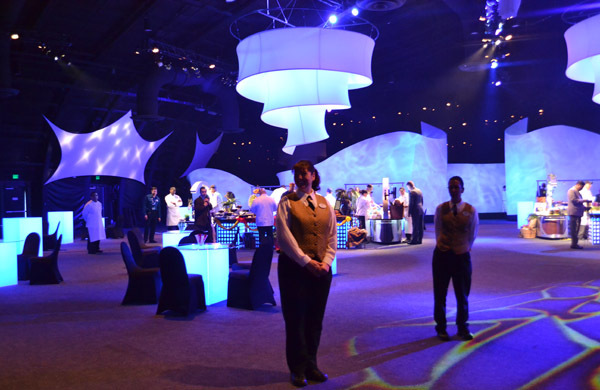 I have been there a few times for Party For the Senses during Epcot International Food and Wine Festival. It was an incredible sight to take in when you entered the room. There was bold lighting with all the Disney Chefs from Disney’s renowned restaurants behind dozens of tables cooking up a storm. The aromas were very appetizing and I couldn’t wait to try everything. The Chefs were very creative and welcoming. I got to speak with quite a few of them and learned some great information on the dishes they were crafting. It was magnificent and they did an excellent job! When we returned from lunch we broke off into groups for various workshops that we signed up for the day before. I liked this approach and how it pieced up the day. I felt I retained more of the information this way. More conferences I have attended in the past didn’t do this, I wish more would. We were able to ask questions and listen to other attendees’ converse with our speakers. It worked out nicely. After the workshops everyone was free to play in the parks until the Illuminations Dessert Party later on in the evening. 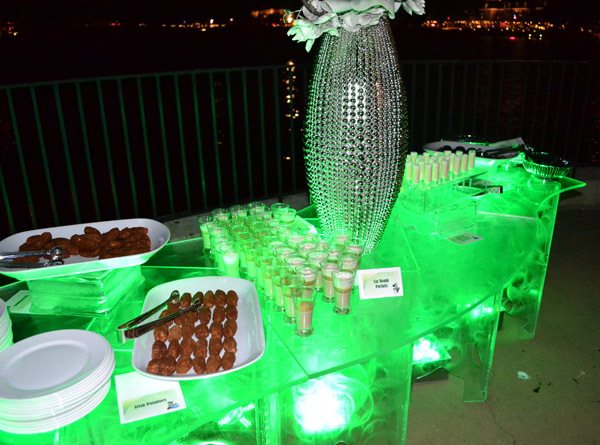 Some of the desserts were the Car Bomb Parfaits, Irish Mist and Cheese Cake Push Pops. My favorite of the evening was the Guinness Ice Cream with Bacon Brittle. The creamy ice cream went so well with the savory brittle. I loved it. It still sticks out in my mind. Illuminations was awesome as usual and it was fun to watch the show with others who have never seen it before. What a great way to end a fun-filled informative day. On the last day we attended a brunch at Whole Foods, Orlando with our families. It was held outdoors on the patio and it was such a terrific way to close the weekend. There was a carving station, assorted fruits, make your own granola station, truffles, cookies, Spinach and Cheese Empanadas, Quiche and more. The two dishes that my family and I loved were the Tofu Scrambler and the Banana Stuffed French Toast. YUM! The Tofu Scrambler tasted just like eggs. I have never tasted tofu that was so outstanding. Yes, I just said tofu was outstanding. The Banana Stuffed French Toast melting in your mouth and the syrup was sweet without being over the top sugary. All the staff at Whole Foods was friendly and did a great job making us wonderful food. All in all this was an inspiring experience. I met some remarkable people and learned so much. I couldn’t wait to share all of this with my friends and family. To tell them what an amazing time this was and the impact it had on me. I can only hope that I will be able to attend again next year. I will take everything from this weekend and put it to notable use. I feel refreshed and ready to create… to tell my story. Special thanks to Julie Deily, Jaden & Scott Hair, Diane Cu & Todd Porter, Pam Brandon, Karen McClintock, Walt Disney World, Kitchen Aid, OXO, Whole Foods, Land O Lakes, Disney Chefs and all the sponsors of the Orlando Food Blog Forum for making this event possible.